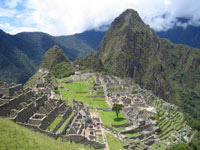 An interesting fascination exists among ancient mysteries researchers, a fascination to connect all ancient sites and artifacts together in some way, imposing perhaps these sites and artifacts all work in conjunction to some degree. It’s not unusual to look at certain mysteries and quickly draw a link between two entirely different parts of the world, because in essence, the link is mostly already provided to us as people and our history. Establishing a link between two distant civilizations is not as simple as identifying similarities in the cultures at face value. In the theory of probability, the chance of two cultures arriving at the same conclusion or using similar building techniques for certain achievements is not out of the ordinary. Take for instance, the matters which are used to reach engineering goals and realize those concepts, they stem from the same basic hard-coded instruction set every human is equipped with from the moment of birth. For example, how many ancient civilizations independently reached the conclusion and conceptualized a method for traveling across water? This is an important observation as it clearly shows the realized goal, reached by many ancient cultures that may have or may not have been in contact with each other prior to discovering a raft or boat. A simplest, predominate example of this is, native populations in North America dugout logs to make ke’nu long before the Spanish or other cultures arrived by boat. The principal of buoyancy remains a constant, and independent cultures realized a way to overcome it, entirely without a direct influence. This tells us, at basic level, that principal concepts are achievable when utilizing core instruction sets of human ingenuity. Then, visualizing connections between ancient cultures over vast distances, abides by mathematical principals of the universe. When given a specific set of instructions, there are a number of possible outcomes, with some more likely to take hold than others. Another example of this is shelter. Our ancestors understood that in order to survive, building structures to protect from the elements are absolutely necessary. Many different types of structures result from thousands of years of engineering, and the shelters which share similar concepts have proved to be the most successful over time. Different cultures arrive at this conclusion in different ways, but are effective nonetheless. The same holds true for vantage points and communication. Height provides the advantage of seeing threats in the distance and an effective means of communication enables strategic knowledge to overcome situations. There is no surprise in thinking ancient cultures built specific structures with height as a vantage point. Constructing pyramids, for example here, mimic natural landscapes and provide an unobstructed view into the distance. This key advantage enabled cultures to see where the enemies might be coming from and it also creates a means of communication. From on top of a pyramid, fire signals can be used to communicate over substantial distances. The pyramid form we find around the world today may actually and simply be a result of the most optimal and successful way to achieve these purposes with readily available resources, and hence why the shape became a somewhat common structure across multiple civilizations.